Order Online - AWD has created an order system to make ordering easier! 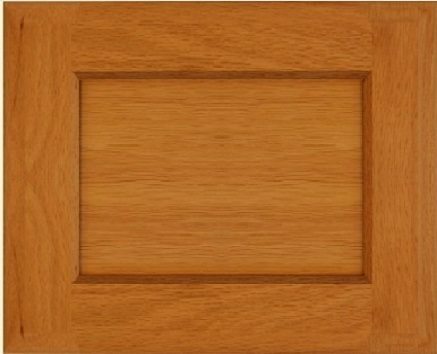 Arkansas Wood Doors offers the finest cabinet doors and the easiest method to order online! Choose from any of our standard cabinet doors below. You will be directed to a page where you can view each door style offered in that category. Please use our convenient online ordering system provided, or you may Print and Email or Fax any of our easy to use order forms. 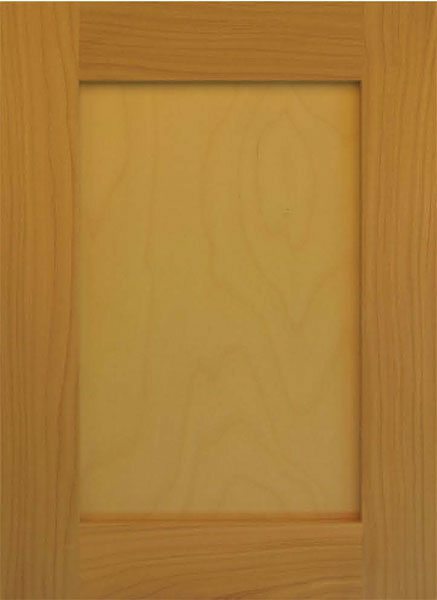 300 Series - Veneer Flat Panel Doors. These Custom Cabinet Doors offer the sleek look achieved with a flat panel. Constructed with 2.25" solid wood frames as standard with a 6mm Veneered Flat panel. This style of Custom Cabinet Door is also available for use in our Stonehenge Cabinets our RTA Cabinet system. Paint grade cabinet doors are made with a 6mm MDF Flat Panel as standard, all other wood species to have 6mm Veneer Flat Panel with matching veneer on back side. 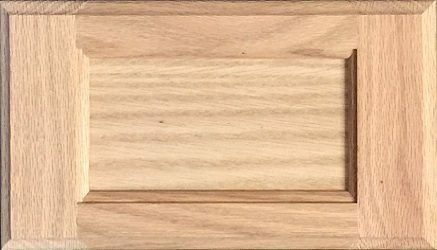 This cabinet door style is available in any wood species, and most species are offered inÂ Clear, KnottyÂ (solid knots with some color variations) andÂ RusticÂ (open and closed knots, natural defects in wood with wide variation in color and grain) Wood Grades. 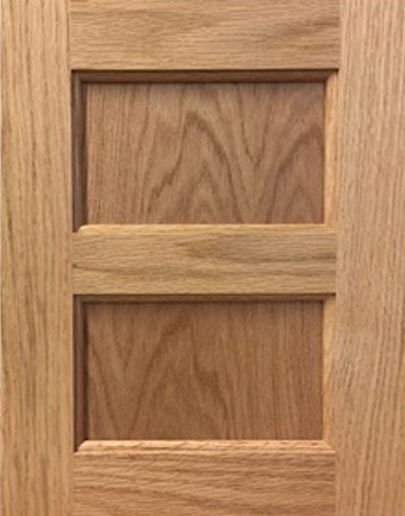 Prefinish is available for this cabinet door style as is our Reversed Raised Panel option. Cabinet doors over 40â³ high will automatically be made with two even panels unless otherwise noted by customer. This cabinet door style is also available for use in our Stonehenge Cabinets, our RTA Cabinet system. 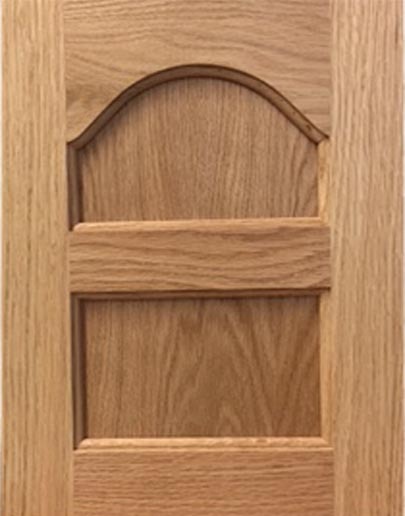 This Cathedral Arch style cabinet door with solid wood frames that are 2.25â³ wide, (custom frame widths available for an upcharge) with 6mm Flat Panel. Paint grade cabinet doors are made with 6mm MDF flat panel as standard, all other wood species to have 6mm Veneer Flat Panel with matching veneer on back side. This cabinet door style is available in any wood species, and most wood species are offered inÂ Clear, KnottyÂ (solid knots with some color variations) andÂ RusticÂ (open and closed knots, natural defects in wood with wide variation in color and grain) Wood Grades. 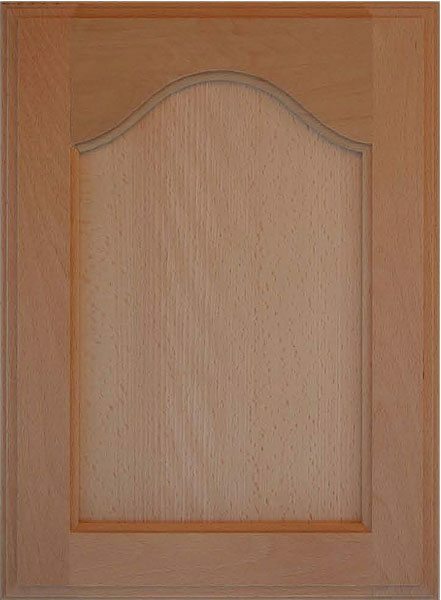 Crown Arch style cabinet door with solid wood frames that are 2.25â³ wide, (custom frame widths available for an upcharge), with 6mm Flat Panel. Paint grade cabinet doors are made with 6mm MDF Panel as standard, all other species to have 6mm Veneer Flat Panel with matching veneer on back side. 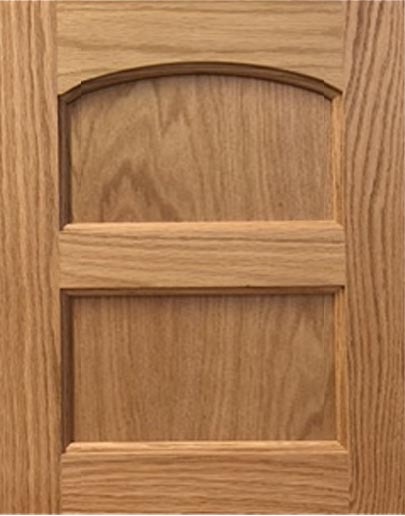 This cabinet door style is available in any wood species, and most species are offered inÂ Clear, KnottyÂ (solid knots with some color variations) and Rustic (open and closed knots, natural defects in wood and wide variation in color and grain) Wood Grains. This cabinet door style is also for use in our Stonehenge Cabinets, our RTA cabinet system. This Twin Panel style cabinet door is manufactured with solid wood 2.25â³ wide frames, with a 1.75â³ wide vertical mullion (custom frame widths available for an upcharge) and our 6mm Flat Panel. Paint grade cabinet doors are made with a 6mm MDF Flat Panel as standard. all other species to have a 6mm Veneer Flat Panel with matching veneer on back side. 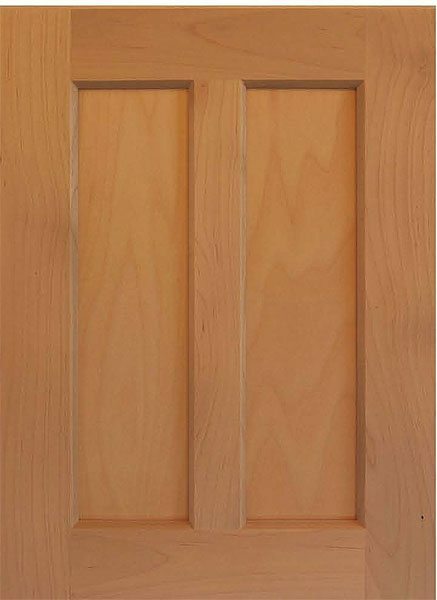 This cabinet door style is available in any wood species, and most species are offered in Clear, KnottyÂ (solid knots with some color variations) andÂ RusticÂ (open and closed knots, natural defects in wood with wide variation in color and grain) Wood Grades. Prefinish is available for this cabinet style as is our Reversed Raised Panel option. Â This cabinet door style is also available for use in our Stonehenge Cabinets, our RTA cabinet system. Square style cabinet door with solid wood frames that are 2.25â³ wide (custom frame widths available for an upcharge) with 6mm Flat Panel. Â Paint grade cabinet doors are made with 6mm MDF Flat Panel as standard, all other wood species to have 6mm Veneer Flat Panel with matching veneer on back side. This cabinet door style is available in any wood species for Clear wood grade, and with most species being available in Knotty (solid knots with some color variations) and Rustic (open and closed knots, natural defects in wood with wide variations in color and grain) wood grains. This style cabinet door is AWDâs automatic default cabinet door style for doors over 40â³ high, unless customer specifies use of 301FP style which will incur a slight upcharge. 300 Series: Solid wood frames with 6mm flat Panel options. This Cathedral Arch style cabinet door with solid wood frames that are 2.25â³ wide, custom frame widths available for an upcharge, with a 6mm Flat Panel. This cabinet door style is available in any wood species for Clear wood grade and with most species being available in Knotty (solid knots with some color variations) and Rustic (open and closed knots, natural defects in wood with wide variation in color and grain) wood grades. This style cabinet door is AWDâs automatic default cabinet door style for doors over 40â³ high, unless customer specifies use of of our 302FP style which will incur a slight upcharge. 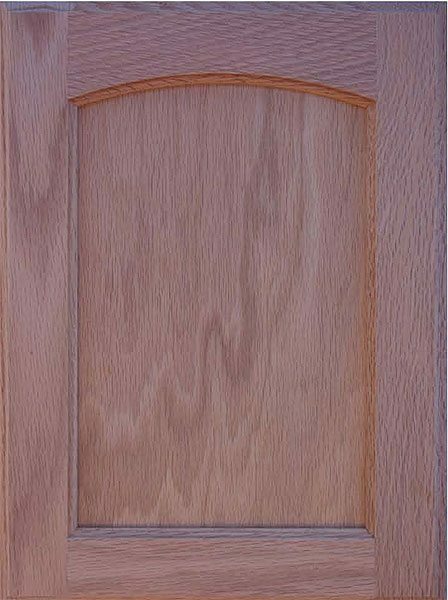 Crown Arch style cabinet door with solid wood frames that are 2.25â³ wide, (custom frame widths available for an upcharge) with 6mm Flat Panel. Paint grade cabinet doors are made with 6mm MDF Flat Panel as standard, all other wood species to have a 6mm Veneer Flat Panel with matching veneer on back side. This style cabinet door is AWDâsÂ automatic default cabinet door style for doors over 40â³ high, unless customer specifies use of our 304FP style which will incur a slight upcharge. 300 Series: Solid wood frames with flat panel options. Slab style drawer fronts are manufactured with laminated strips of wood to make width. This drawer front style is available in any wood species for Clear wood grade and with most species being available in KnottyÂ (solid knots with some color variations) and Rustic (open and closed knots, natural defects in wood with wide variation in color and grain) wood grades. Prefinish is available for this drawer front style. 201 slab style drawer front is also available for use in our Stonehenge Cabinets, our RTA cabinet system. 200 Series: Slab style drawer fronts with laminated strips of wood to make width. This style drawer front is manufactured with 2.25â³ wide solid stiles, and 1.5â³ wide rails, (custom frame widths available for an upcharge) and 6mm Flat Panel. Paint grade drawer fronts are made with 6mm MDF Flat Panel as standard, all other wood species to have 6mm Veneer Flat Panel with matching veneer on back side. This style drawer front is available in any wood species for Clear Wood Grade and with most species being available in Knotty (solid knots with some color variation) and Rustic (open and closed knots , natural defects in wood with wide variation in color and grain) Wood Grades. Prefinish is available for this drawer front style as is our Reversed Raised Panel option. This drawer front is also available for use with our Stonehenge Cabinets, our RTA cabinet system. This style drawer front is manufactured with 2.25â³ wide solid frames around entire perimeter of drawer front, (custom frame widths available for an upcharge) and 6mm Flat Panel. This drawer front style is available in any wood species for Clear Wood Grade and with most species being available in Knotty (solid knots with some color variation) and Rustic (open and closed knots, natural defects in wood with wide variation in color and grain) Wood Grades.